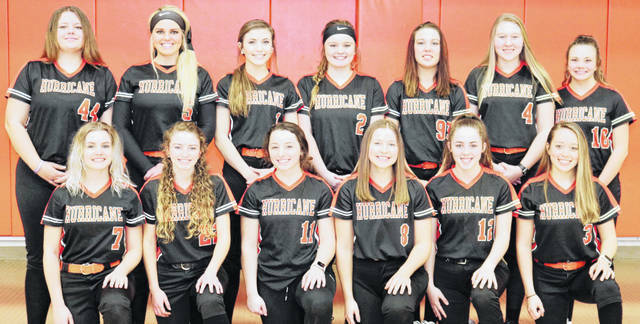 The Wilmington High School softball team, from left to right, front row, Sophie Blessing, Alix South, Harlie Bickett, Jena Rhoads, Logan Osborne, Emily Spendlove; back row, Kelsey Sprowle, Olivia Veidt, Emily Self, Grace Brown, Kendra McKenna, Madison Flint, Hannah Gordon. Though this is his first season as the Wilmington High School varsity softball coach, Brian Spurlock has plenty of coaching experience. And he has plenty of returning talent to hopefully improve upon Wilmington’s third place finish in the SBAAC American Division last season. Spurlock said there are 10 returning varsity players, led by SBAAC first teamers Olivia Veidt and Harlie Bickett and second teamers Sophie Blessing and Madi Flint. “I feel very fortunate to inherit a team of young women with incredible talent, strong work ethics, and positive attitudes,” said Spurlock, who will be assisted by Lacy Myers, Josh Bickett and JV coach Jimmy Cramton. Wilmington was 9-10 last season in Glen Blessing’s last year as head coach. Spurlock comes in after serving as a fast-pitch coach for six years and a men’s military softball coach for 10 seasons. Courtney Smart, a first team All-SBAAC all-star in 2018, is the top 2018 graduate not returning to the Lady Hurricane squad. Jena Rhoads is a key newcomer, Spurlock said.